Old age restricts many elderly people from being able to do simple activities of daily living which we tend to take for granted in our young days. One such activity is personal grooming and hygiene, specifically in terms of clipping toenails. In their advanced years, many seniors find it difficult to handle small tools like toenail clippers in their hands and fingers due to arthritis or lack of coordination. It also becomes difficult for them to bend over to reach their toenails properly as they get older. However, there are many special toenail clippers that are now available which the elderly can easily use for taking care of their personal foot hygiene. In this post, we will learn more about buying toenail clippers for the elderly for safe, independent foot care. In a hurry? Here are my favorite clippers for use by seniors and the elderly. Click here to jump to more detailed descriptions and reviews of my recommendations. 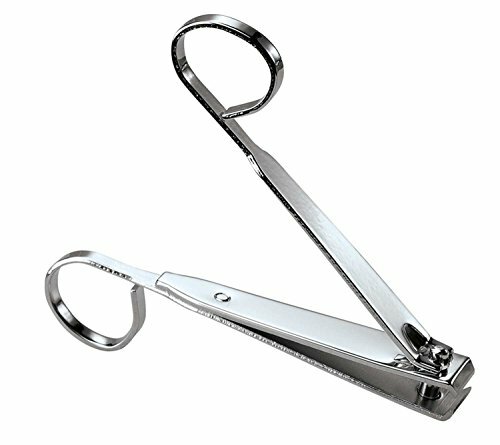 Why do Seniors Need Specialized Nail Clippers? In most cases, elderly people continue to use the same ordinary nail clippers they have been using their whole lives, often without even realizing that even a small cut or a nick could result in a painful and troublesome infection. For these reasons, elderly people must carefully trim their toenails and should use specially designed tools to take care of their foot care, which they may not even know about yet. Are the clippers sturdy enough for ease of use, without needing to apply too much pressure? Are the handles ergonomic and long enough to allow easy use without the need for bending over? Do they have long enough handles with a soft grip, to allow easy handling? Do the clippers have a wide jaw to cut thicker nails? Is there a safety tip cover for the protection from accidental pokes and cuts? Do the clippers have a cover to catch clipped nails? What material are they made of? Are they prone to rust or corrosion? Answering questions like these will help you find the best toenail clippers for the senior in your life, and give you peace of mind with your final decision. There are quite a few tools available which cater to the specific needs of the elderly in terms of foot care and nail clippers, specifically. It is quite obvious that any clippers marketed for the elderly population should be easy to hold and use, while also reducing the chances of any injury or general discomfort. Here are a few of the toenail clippers I recommend for use by the elderly. CUT WITH EASE: Are you sick of struggling with thick, hard or ingrown nails? 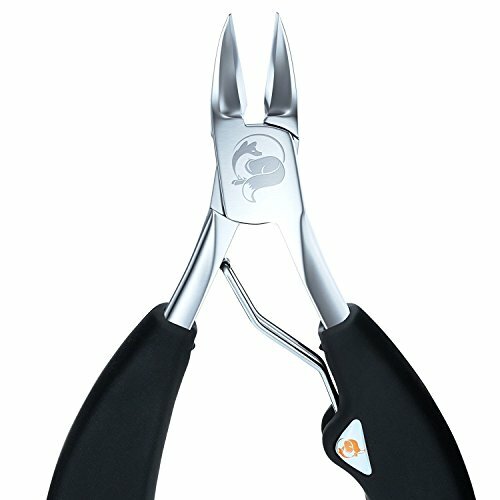 Our toenail clippers incorporate several unique features specifically designed to easily cut the toughest nails. No more expensive trips to the podiatrist! HAND-HONED BLADE: Unlike our competitors, we finish the edge of our blades by hand. Not only are they razor sharp, they stay sharper longer. This, combined with the carefully designed curved blade, results in an amazing nail cutting experience. BUY WITH CONFIDENCE: Effortlessly trim even the toughest nails or your money back! We proudly offer a lifetime replacement policy. If you are ever unhappy with your clippers in any way, simply contact us. We promise to make it right within 24 hours. ERGONOMIC GRIP DESIGN: Wouldn't you appreciate a tool that allows you to effortlessly maintain your nails without discomfort? 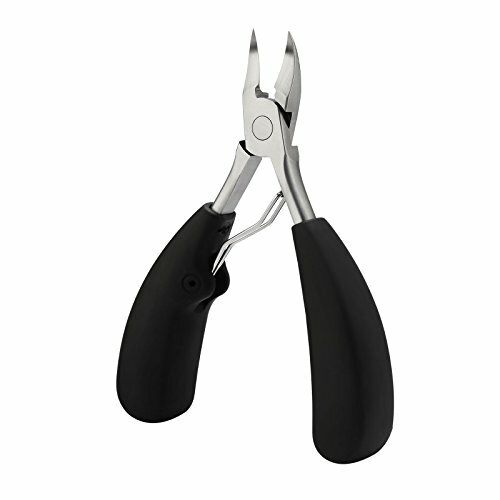 Our professional toenail nippers utilize a proprietary soft-grip handle to maximize grip and comfort even while wet. MEDICAL GRADE: We at Fox Medical Equipment insist on surgical grade stainless steel in all our nail care products. We offer a full line of nail nippers, fingernail clippers, cuticle scissors, ingrown toenail lifter tools and clinical grade cutters. These clippers are a great choice for thick, tough toenails. They are designed to give the user more leverage to easily trim hard to cut nails. The handle has a soft grip and works more like scissors which may be easier for some seniors. Made of durable stainless steel and includes a tip cover to reduce the chance of accidental injury. These clippers feature loops on the ends like a pair of scissors. This lets the senior use their entire hand to control the clippers instead of just their fingertips. Helpful for people with arthritis in the fingers. Folds for easy storage and travel. ✔ Made of medical-grade stainless steel guaranteed not to rust, tarnish or corrode, safety and health; durable and sturdy; sharp yet safety. ✔ The top of the nail nippers deeps inside the nail groove. And the nail lifter head is smooth and delicate, easy to remove the sip dirt and will not hurt your nail and skin. ✔ Feel comfortable and effortless, easily remove thick nail/ ingrowing nail/healthy nail/thick toenail/dead skin. 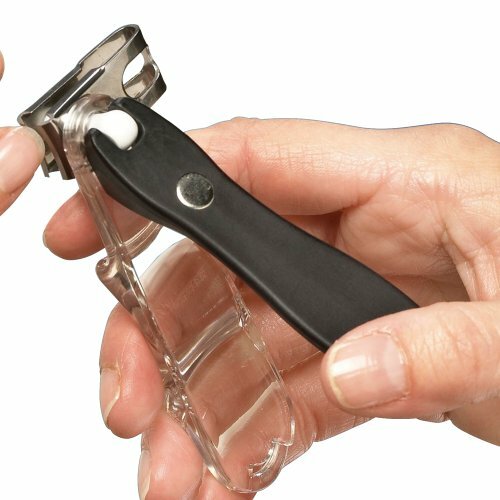 ✔ Soft-grip handle gives you plenty of leverage and more control - so clipping your toenails is faster and less painful. Ideal for seniors with arthritis or weak hand strength. ✔ 100% Satisfaction Guarantee: If you're not 100% satisfied with our product, let us know within 30 days of purchase and we'll issue a full refund. These clippers are designed for people with thick, ingrown toenails but who also have limited hand strength. The larger handles are covered in soft foam to help the senior maintain their grip. They also give them more leverage and control while trimming the nails. Includes a lifter to help reach the ingrown part of the nail. This one is a good choice for people with arthritis or limited hand strength. 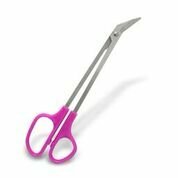 STAINLESS STEEL: Made with high grade stainless steel, these nail scissors with the purple tight grip handle and angled blade provides maximum comfort and gets the job done on the first snip! MAXIMUM CONTROL: These stainless steel nail scissors, with a purple, tight grip handle and angled blade, provide the most amount of control and comfort possible! 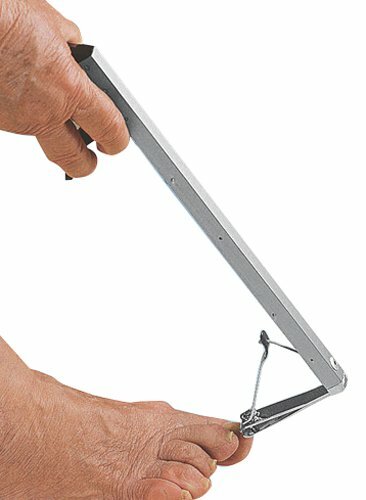 LESS STRESS: With the extended handle design, you'll have a much easier time trimming your nails without the need to be hunched over and cramped up. SATISFACTION GUARANTEED: We know that the craftsmanship on these scissors is a cut above the rest. You'll never want to use anything else to trim your nails. Longer handled clippers like these are good for seniors and elderly who have trouble bending over to reach their feet due to arthritis in the hips or back, poor flexibility, and loss of balance. This style of toenail clipper is recommended for thick, small, ingrown and other types of nails. Nail trimming is easy again! Say goodbye to awkward twisting and painful handling while cutting your fingernails or toenails. Ergonomic trimmer with stainless steel blades has wide, easy-grip handles with smooth swivel action allowing you to find the optimal angle for cutting. Perfect for those with arthritis and limited dexterity. These nail trimmers are ergonomically shaped with a cutting head that turns toward the nail. This creates a more natural cutting position. Instead of the senior having to manipulate their arms and shoulders to get the right cutting angle, the trimmers themselves adjust. Large handle allows the full palm to control the clippers. Another good choice for those with arthritis or poor hand dexterity. For seniors who take care of their own feet, but may not be able to bend over entirely and perform the motion needed to properly clip their toenails, clippers with long handles solve this problem. This particular pair provides great leverage and control over the clipper part, with a simple to operate trigger maneuver. You can also use this with your right or left hand, whichever is more comfortable for you. Try clipping toenails after a bath or after soaking them in warm water, as this will soften your toenails and make them easier to cut. It will also ensure that they’re clean and free of any potential irritants like dirt or grime, which can be pushed farther into the nail bed by nail clippers. Keep checking on your feet on a regular basis to ensure that there are no unusual sores or scrapes on them. This type of issue can be exasperated easily if not treated right away, so regular inspection is very important, especially for elderly people. If you cannot check them regularly, ask for help from your family or professional caregivers. After a bath, make sure that you have dried your feet completely. Any leftover moisture can lead to fungus and infections, so making sure that your feet, and nails especially, are completely dry can prevent these issues. Wear clean, dry and breathable socks at all times, and especially after a shower or bath. Also, consider wearing a foot moisturizer to keep your nails from splitting or cracking, which can be painful. This will allow them to stay nourished and comfortable, without the potential dangers of keeping them wet. Trim your nails on a regular basis to ensure that any debris doesn’t get trapped below them. Be careful when clipping nails to ensure that you don’t cut or nick the skin around your nails accidentally. You may need assistance from caregivers for this task depending on your needs. Caring properly for the feet is an important part of an elderly person’s care. It is important to have the right tools for the job as well, especially for seniors who do their own foot care. Using the right toenail clippers for the elderly will reduce the chance of injury, and will also enhance their general comfort levels. This is why a high quality toenail clipper is such an important part of a senior’s hygiene regimen. Do you have any experience taking care of a senior’s feet? Please share your experience below with any tips I missed, or best practices you’ve found helpful. Questions are also always welcome! What I need is a very long handled toenail clipper with the wide ‘flat’ edge, just like ordinary toenail clippers. For some reason, they don’t ship from Canada, so $90.00 for the clippers, plus $170.00 for ‘shipping costs’ from the U.S. Do you know of any outlet that sells the long handled clipper with the flat edge, that wouldn’t charge the ridiculous exhorbitant charges for the clippers to be shipped? Hello Mary Lou! Hope all is well. I’ve been researching your request. I found this pair with really long handles at Amazon. But, I don’t have an account on amazon.ca to see if they are available in Canada. This model is made by a company called Ableware/Maddak who is known for making creative solutions for the disabled and elderly. Check out their website and maybe they can locate a Canadian source for you. Hope I’ve helped a little.